Nestled adjacent to US Forest Service land, this electronically controlled gated property boasts both being private and secluded. but at the same time ten minutes from Espanola, and forty five minutes to Santa Fe. It shares similar views and landscapes that inspired Georgia O'Keeffe. 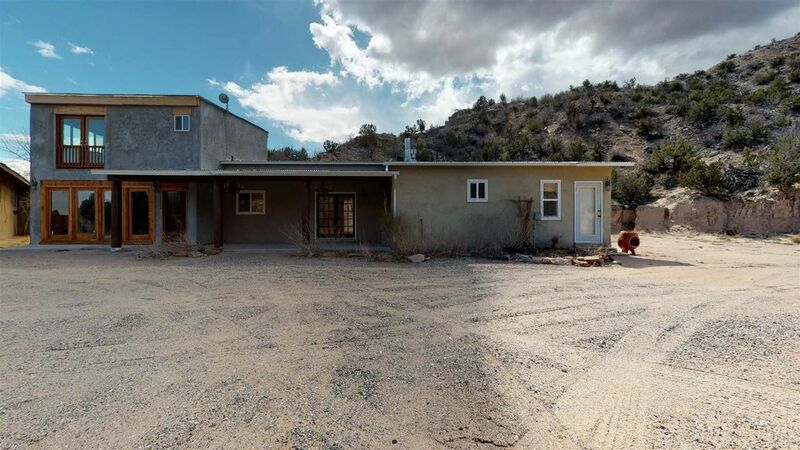 The frame home, built by the only owner in 1995, is located to the rear of the property, thus adding seclusion and access to the Forest Service land for hiking, horses or ATV. A nearby abandoned town is within a short hike. There are Native American ruins/settlement also nearby where chards and even a kiva is still present. Some of the views visible from the property are the Santa Fe Ski basin, the Sangre de Cristo Mountains, and La Silla del Gigante. This home is passive solar is very light and airy but efficient and welcoming. The two-sided-fireplace is a nice accent to the 18' ceiling entry and living area, having a 3" thick naturally patina redwood top lintel on corbels and lower flagstone banco at fireplace opening. Beautiful natural pine floors in natural finish throughout the main part of the home. Travertine tile was used for the bathrooms, laundry room back room and countertops, brick entryway, 4' stairway with 3" thick beam steps. 6'X3' shower, matching natural maple kitchen and laundry room cabinets, Kohler plumbing fixtures, Schlage and Baldwin locks and much - much more. Private, open, lot's of Low E glass, air, space and privacy in a wonderful location.